The phrase "the best of all possible worlds" (French: le meilleur des mondes possibles; German: Die beste aller möglichen Welten) was coined by the German polymath Gottfried Leibniz in his 1710 work Essais de Théodicée sur la bonté de Dieu, la liberté de l'homme et l'origine du mal (Essays on the Goodness of God, the Freedom of Man and the Origin of Evil). The claim that the actual world is the best of all possible worlds is the central argument in Leibniz's theodicy, or his attempt to solve the problem of evil. Among his many philosophical interests and concerns, Leibniz took on this question of theodicy: If God is omnibenevolent, omnipotent and omniscient, how do we account for the suffering and injustice that exist in the world? Historically, attempts to answer the question have been made using various arguments, for example, by explaining away evil or reconciling evil with good. Giovanni Gentile, in his work The General Theory of Mind as Pure Act, claimed that if God had created everything to fall into line with the most favorable possible condition, it would suppose that all of reality is pre-realized and determined in the mind of God. Therefore the apparent free will displayed by both God, by his necessity of being bound by what is the most good, and humanity in their limitations derived from God to be inline with the most good, are not free wills at all but entirely determinate. Thus ultimately relegated to blind naturalistic processes entrapping both God and humanity to necessity, robbing both of any true freely creative will. Critics of Leibniz, such as Voltaire, argue that the world contains an amount of suffering too great to justify optimism. While Leibniz argued that suffering is good because it incites human will, critics argue that the degree of suffering is too severe to justify belief that God has created the "best of all possible worlds". Leibniz also addresses this concern by considering what God desires to occur (his antecedent will) and what God allows to occur (his consequent will). Others, such as the Christian philosopher Alvin Plantinga criticized Leibniz's theodicy by arguing that there probably is not such a thing as the best of all possible worlds, since one can always conceive a better world, such as a world with one more morally righteous person. The Theodicy was deemed illogical by the philosopher Bertrand Russell. Russell argues that moral and physical evil must result from metaphysical evil (imperfection). But imperfection is merely finitude or limitation; if existence is good, as Leibniz maintains, then the mere existence of evil requires that evil also be good. In addition, libertarian Christian theology defines sin as not necessary but contingent, the result of free will. 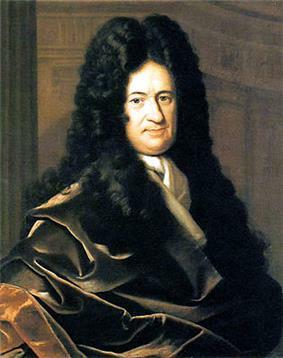 Russell maintains that Leibniz failed to logically show that metaphysical necessity (divine will) and human free will are not incompatible or contradictory. ^ Lane, William C. (January 2010). "Leibniz's Best World Claim Restructured". American Philosophical Journal 47 (1): 57–84. Retrieved 9 March 2014. Project Gutenberg provides an Theodicyonline English translation of the .